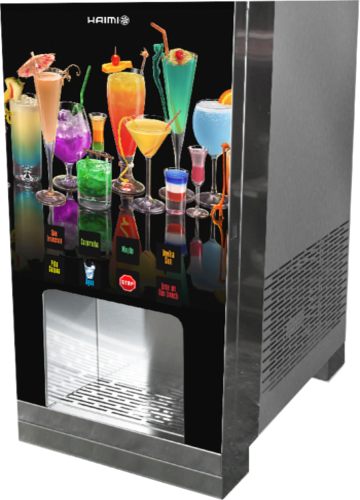 Our cold cocktail dispensing machines for are ideal for hotels, restaurants, catering, and sports centers. They are perfect for large number of buffet services and provide clean solutions to the catering sector. They dispense cocktails in an instant and cold way, allowing a direct enjoyment. Our cocktail dispensing machines have 3, 4, 6 or 8 channels plus one for water. Depending on their size, the refillable container can be inside or outside. They have a capacitive touchscreen, and we can customized its front panel with your logo or design. Since its origins in 1991 Haimi has always tried to provide a solutions to an increasingly demanding market. Our extensive experience 25 years has given us a know-how in manufacturing, distributing and marketing industrial cooling systems with the purpose of getting a satisfied customer. In our catalog we have a wide variety of wine coolers for beers, drinks, and wines for correct conservation. We offer bespoke solutions in wine coolers. Trying to provide answers to the needs of our clients. adapting to the requirements of our client's space. In this innovation line, we have developed a range of bag-in-box juice, milkshake, beverage, and cocktail dispensers for hotels and buffets, with good technology and quality materials that supply excellent served drinks. Thanks to this constant innovation we have created our vending machines, easy to maintain and accepting different means of payment.